It was yet another gorgeous day for my weekend photo shoot in dad's garden, and this week I decided to concentrate completely on creepy crawlies. 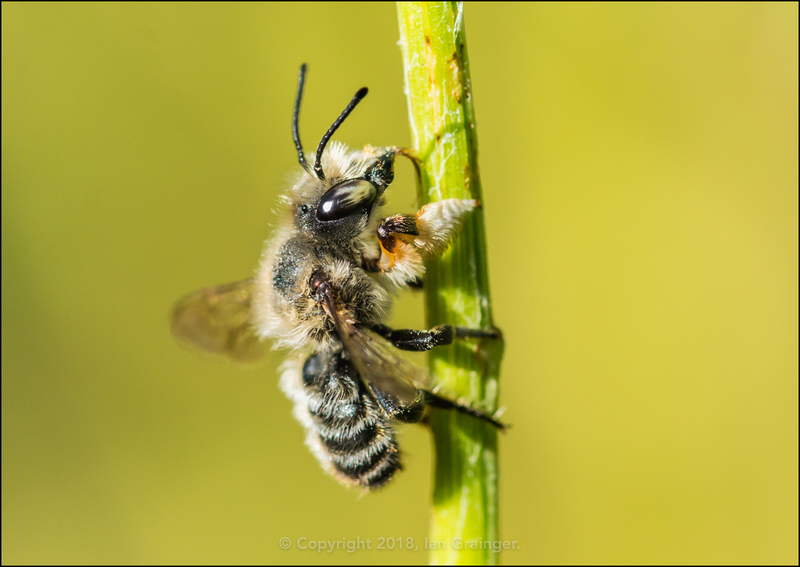 It seemed that this week was the week of the Leaf Cutter Bee (Megachile). This fine specimen caught my eye as it made it's way up several flower stalks, traversing from bottom to top before taking off to visit another stem. Don't you just love those hairy front legs? 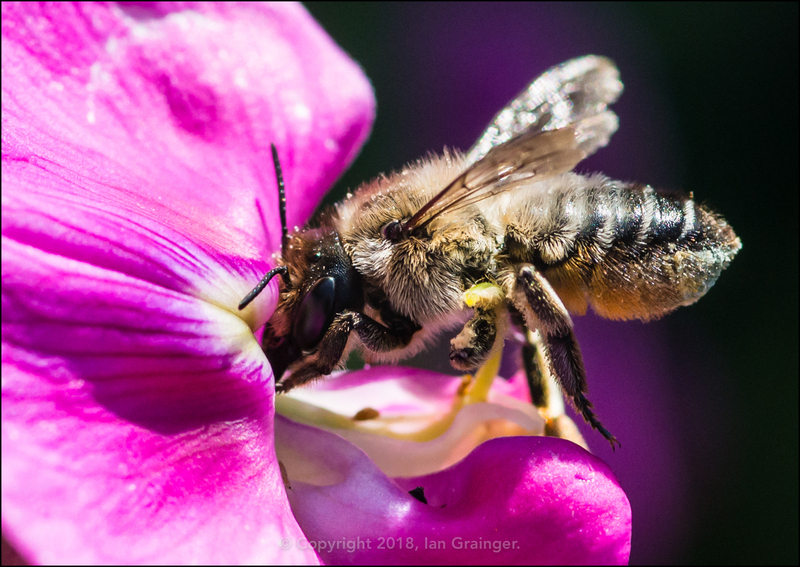 A different species of Leaf Cutter Bee was taking time to visit each Sweet Pea (Lathyrus odoratus) bloom, and seemed to be storing the pollen it collected on the underside of its abdomen. 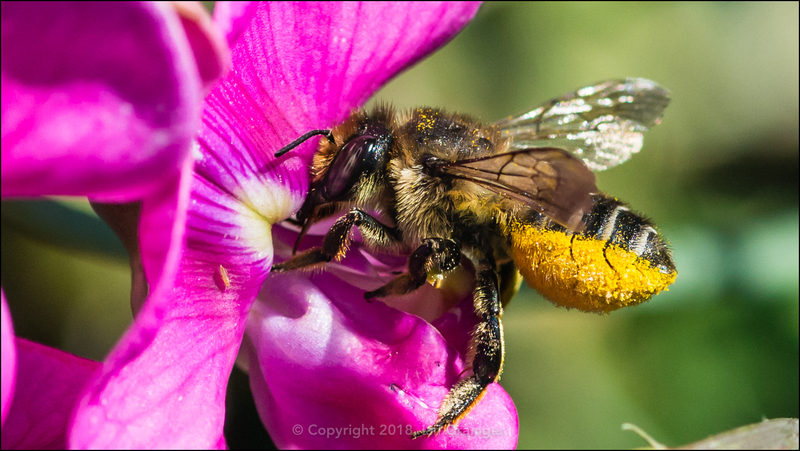 Yet another species was doing similar, methodically visiting each bloom in turn, until there were no more flowers left to visit. 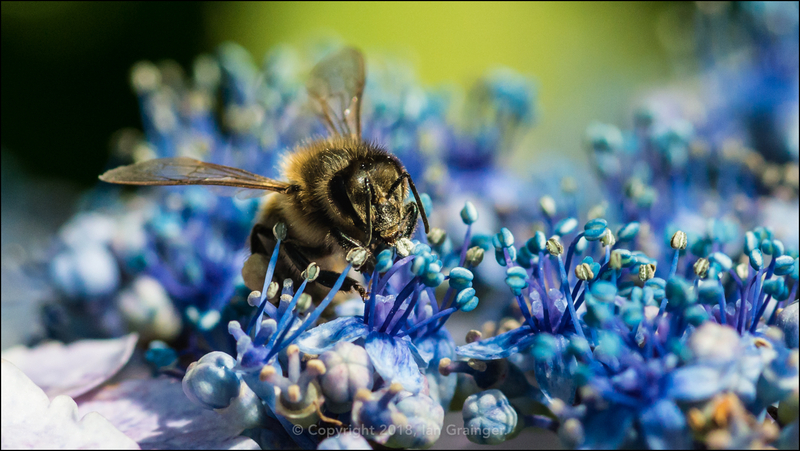 This Honey Bee (Apis mellifera) was difficult to get a decent shot of as it manically visited each and every tiny Lacecap Hydrangea (Hydrangea macrophylla) flower in sight. 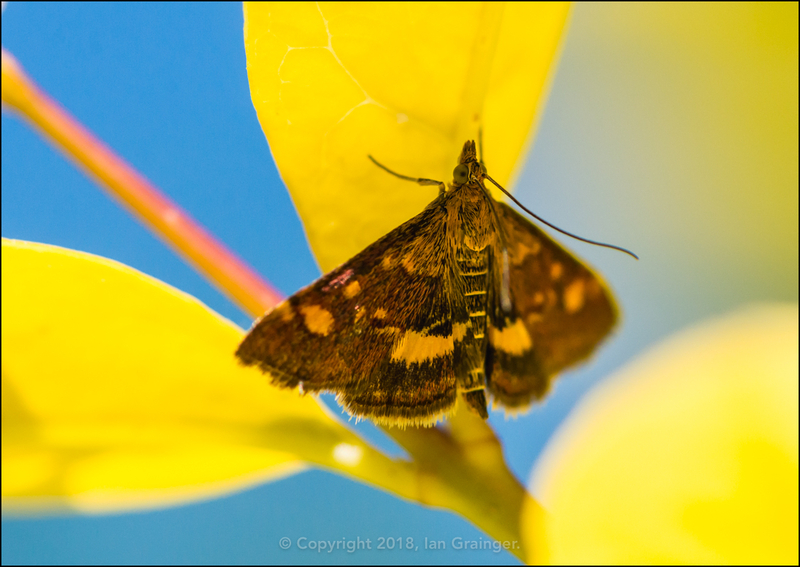 I was very pleased to come across this Mint Moth (Pyrausta aurata) resting on the underside of a Privet hedge leaf. They used to be quite a common sight, but this was the first one I'd seen in several years. 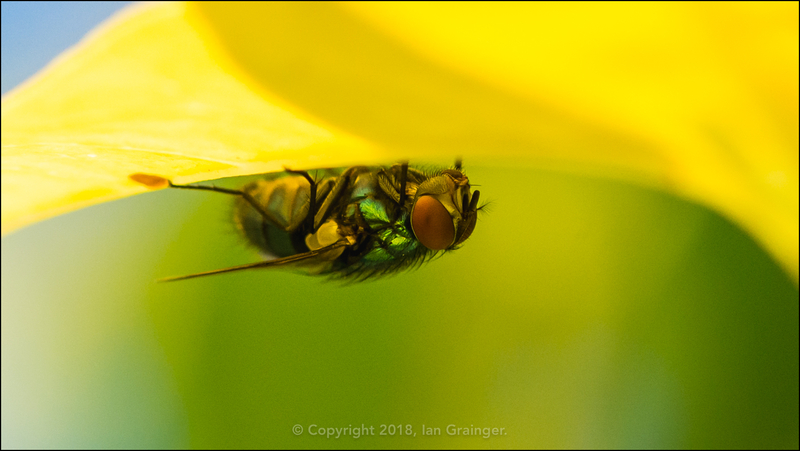 As I took several shots of the Mint Moth, I also spotted this Greenbottle (Lucilia caesar) fly, lurking beneath a leaf in the same hedge. 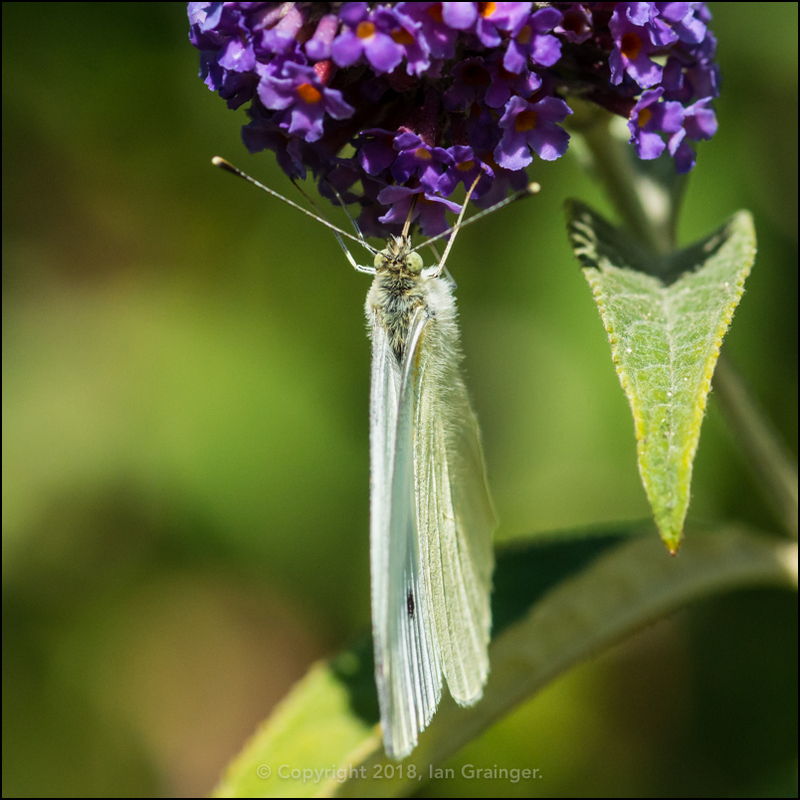 Turning my lens towards the butterfly population, I first came across a Small White (Pieris rapae) butterfly enjoying the pollen from a newly opened Butterfly Bush (Buddleia) bloom. 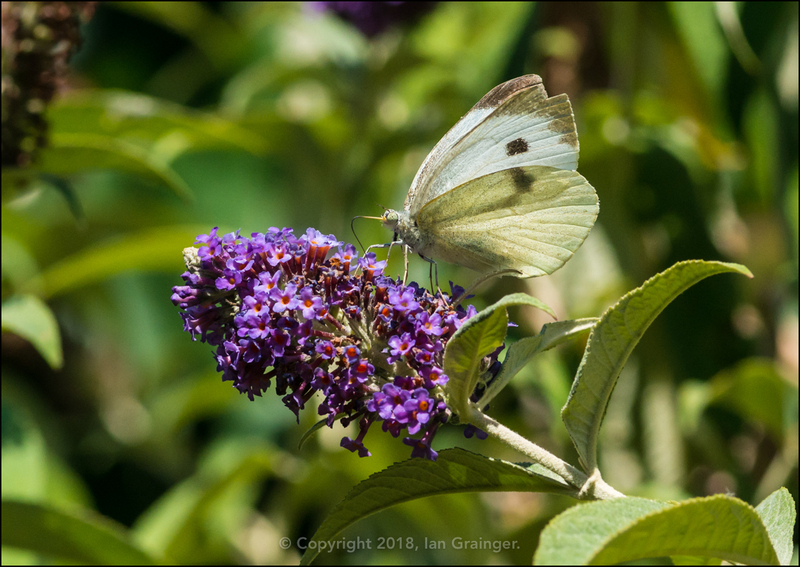 Close by on the same bush was its larger cousin, a Large White (Pieris brassicae) butterfly. 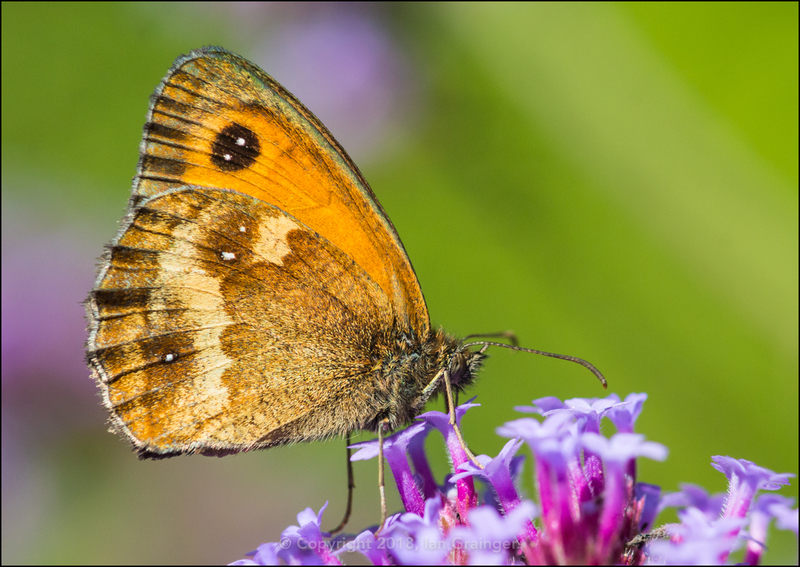 ...which was also a popular destination with the Gatekeeper (Pyronia tithonus) butterflies. 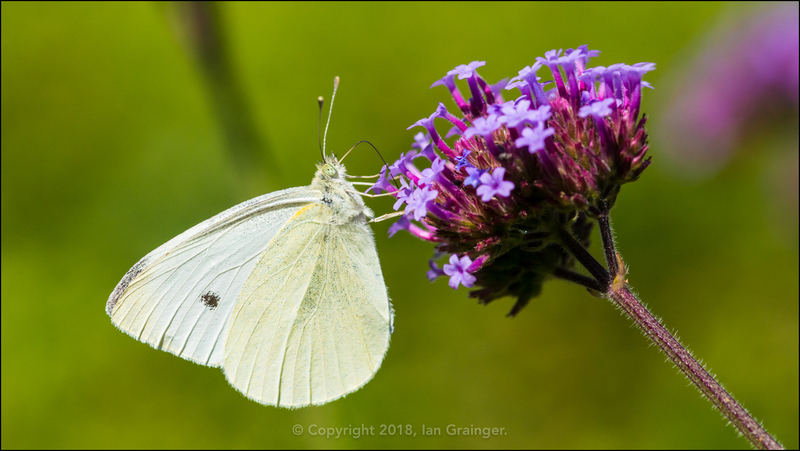 As I stood taking photos of the butterflies, a fluttering insect caught my eye. 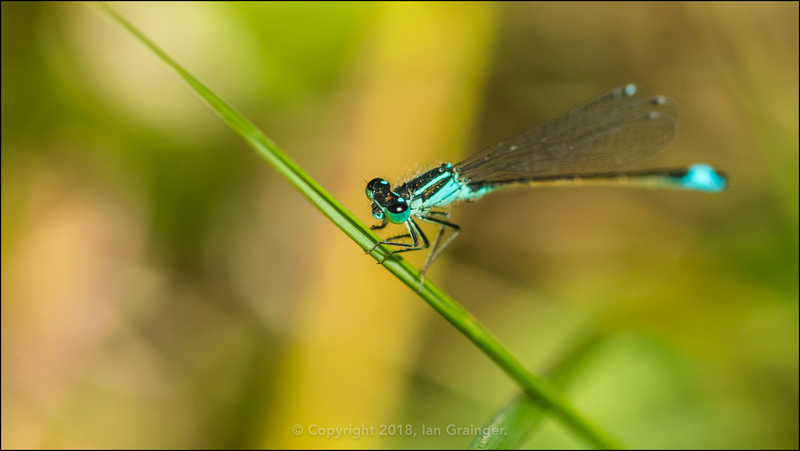 I eventually found it resting on a stem of grass, and it turned out to be a Blue Tailed Damselfly (Ischnura elegans). 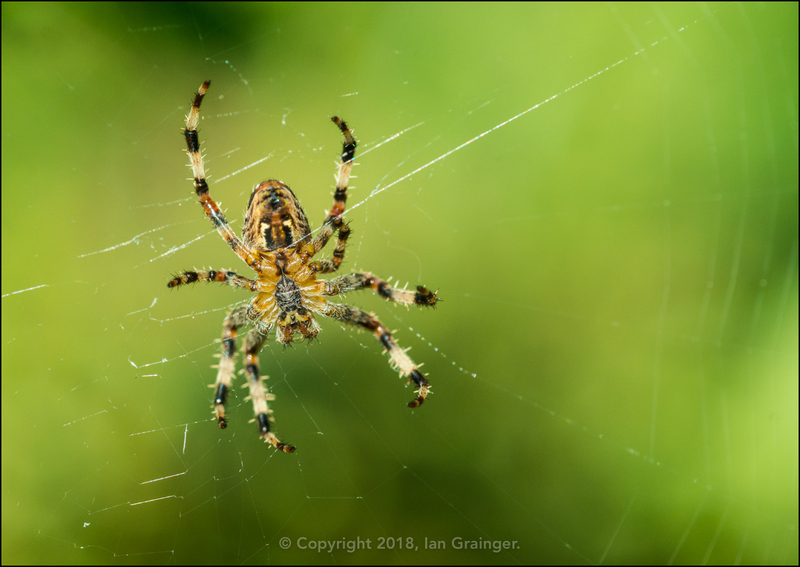 The heat finally got the better of me, and as I made my way back indoors, like an unsuspecting fly, I almost found myself entangled in the web of this Garden Spider (Araneus diadematus). Finally this week, an old fishy friend. 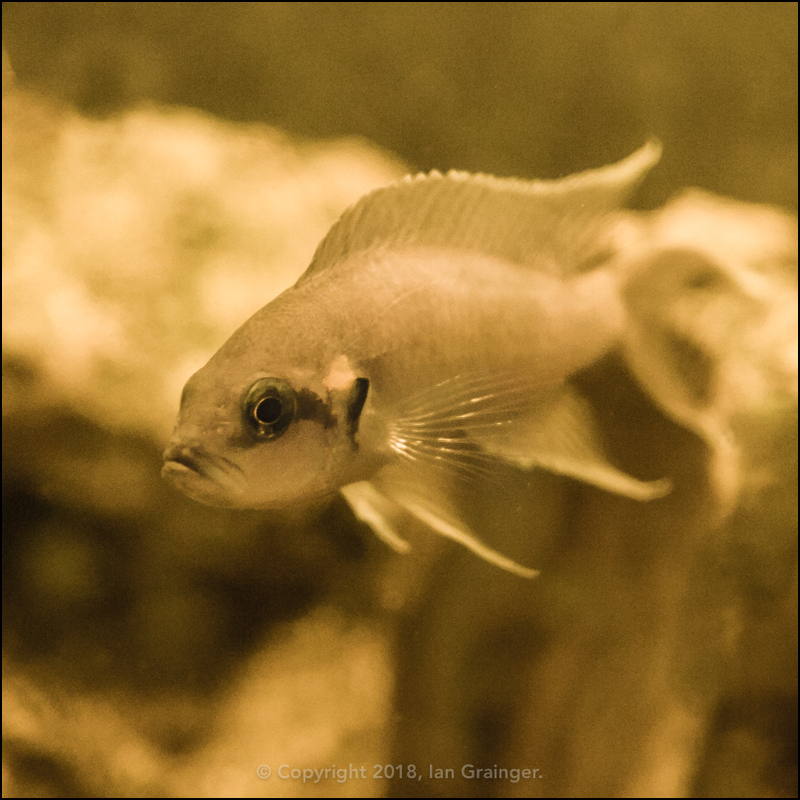 This is Neolamprologus Brichardi, more commonly known as the Fairy Cichlid. This is one of a group I had back in 2008 when I tried breeding them. Unfortunately, although they spawned many times, the eggs were always eaten, and I never managed to raise any fry.